Have you ever wanted to exact revenge on a vile villain after watching a movie or reading a book? Were you gutted by the ending of the first Avengers: Infinity War movie? What if we told you there's a way you could take on Thanos yourself? 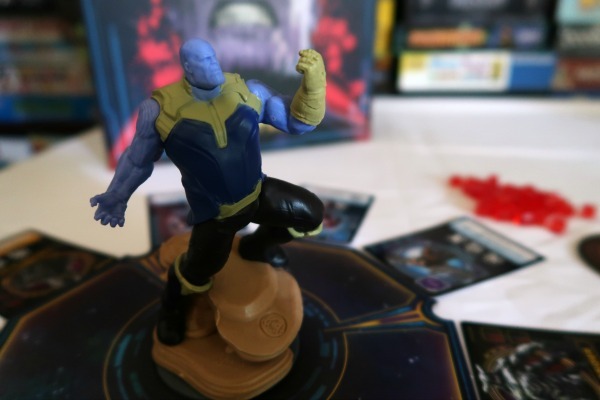 Receiving Thanos Rising: Avengers Infinity War game by USAopoly for review provided the perfect opportunity for us to work through our feelings after seeing Avengers: Infinity War. 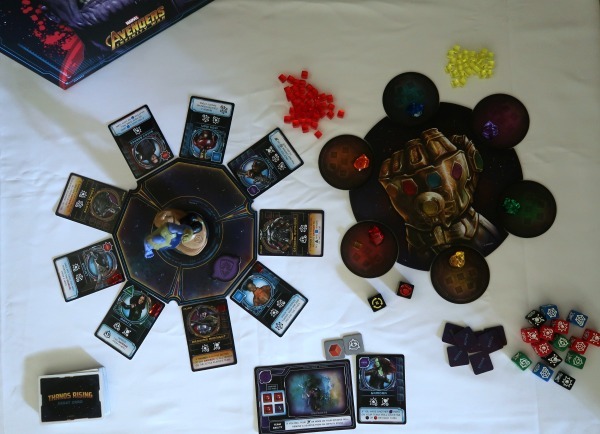 Thanos Rising is a cooperative tabletop dice and card game for 2 to 4 players. It's you versus Thanos and his minions. As with most other cooperative games, there are many ways to lose and only one way to win. You win by defeating ten of Thanos' minions (or seven as a novice player). Thanos wins if he gets all infinity stones, if ten heroes are killed, or if he destroys a player's base (all of their heroes have been killed). Each player starts with one of the four starting heroes (Captain America, Gamora, Doctor Strange, or Black Panther) and a base of operations. From there, the rest of the deck is shuffled and the top 9 cards are drawn and placed in a circle in the three sectors around the Thanos figure. These could either be heroes or villains. Each turn starts with the active player choosing one of the three sectors and placing their token on it. Only the three cards located within this sector can be interacted with, either hero or villain cards. 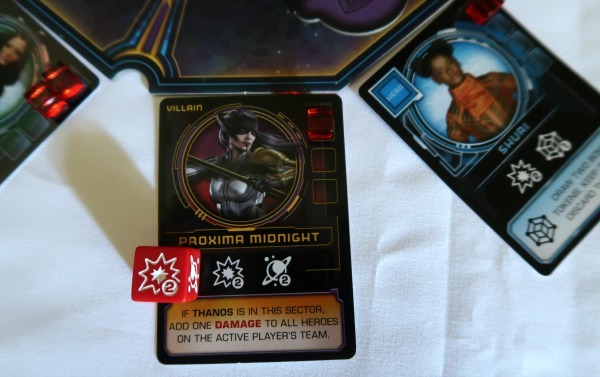 Once the deployment token is placed, Thanos takes his turn. This is done by rolling the Thanos dice. 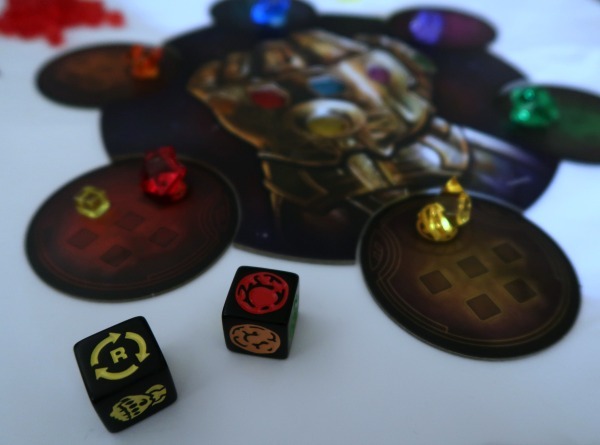 The first die tells you which Infinity Stone gets a yellow cube added to it. If a stone accumulates five cubes, Thanos acquires it and its ability fires off. Those are never good. The second Thanos die tells us what he does during his turn. He either rotates a sector to the left or to the right, re-rolls his Infinity Stone die, or uses the gauntlet to activate the abilities of all the villains outside of his sector. Yes, that's as bad as it sounds. Then, after turning Thanos to another sector if he needs to be turned, he affects all cards in the sector he is facing. He hits each hero in the sector for one damage and each villain in that sector fires off its ability. This includes hitting the active player's heroes for one damage each if their deployment token is in that sector. This is a detail we missed initially. In full transparency, it took a few plays (including our playthrough on Twitch) before realizing our heroes were also supposed to take damage while in Thanos's sector. Next, it is the player's turn. At this point, you and your team members decide what your goal should be. Will you try to recruit a hero or will you try to damage a villain? Once you decide, you roll the pool of dice located on your base card instructions (plus any bonuses you may have based on your hero cards as the game goes on). Each die consists of four symbols: Damage, Cosmic, Mystic, and Tech. 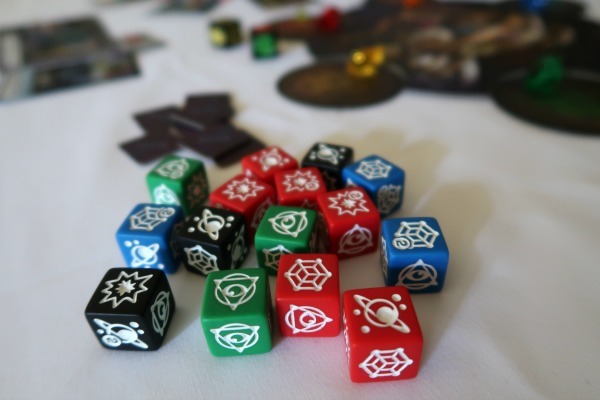 Some colors of dice have more of a specific type, such as the green ones having a higher chance of rolling a Mystic, etc. To recruit a hero or damage a villain, you need to match the number of symbols located on a card (i.e., 2 Cosmic and 1 Damage). If you match all of the symbols on a hero card, you recruit that hero to your team. If you match all of the symbols on a villain card, you damage that villain for one damage, plus you get to take a bonus token. These tokens can be used at any time throughout the game and give things like bonus symbols for rolls, bonus die to roll, and removing damage from heroes. This process repeats itself and all players can help each other out. But, beware, as with most games of this type, the longer you take to defeat villains the faster the Infinity Stones fill up. But, what if I want to recruit more heroes onto my team? That is a good question and one only answered by you and your teammates. Will Thanos and his minions prevail? If you like cooperative games and also like superheroes, this is the game for you. We love this game. Not only do we usually enjoy cooperative games, but adding the Marvel superhero theme adds a fun twist. Plus, if you've seen Avengers: Infinity War already, you probably have a least a dozen reasons why you want to defeat Thanos. Since this is a cooperative game, everyone in our family can play, even though the box recommends ages 10+. We have played two player several times. We've also played this game with our children, ages 7 and 5 years old. Cooperative play makes it easy to help coach kids through their turn while teaching them strategy at the same time. You can openly discuss options for everyone's turn and share the reasons why you chose certain actions. We are always excited to play this again and see how it turns out. My wife and I lost the first time we played, but we looked forward to trying again. It's fun to discuss what happened and strategize for the next time we play. Plus, it gives us some relief after the movie. Recently we introduced some of our friends to Thanos Rising. They have not played many games like this and look forward to playing it again soon. While the rulebook may look a little daunting, overall it is easy to pick up and learn after a couple rounds. It is also easy to teach, which we find important when introducing new games to friends. Game play feels quick, although it takes about 45 minutes to play through a game. Teamwork helps keep analysis paralysis and overthinking to a minimum. We also like being able to adjust the difficulty level. It's suggested to start with defeating seven villains to win. After winning a couple times, you can increase the number of villains needed up to 10. Really want a challenge? Start your game with one counter on each Infinity Stone. 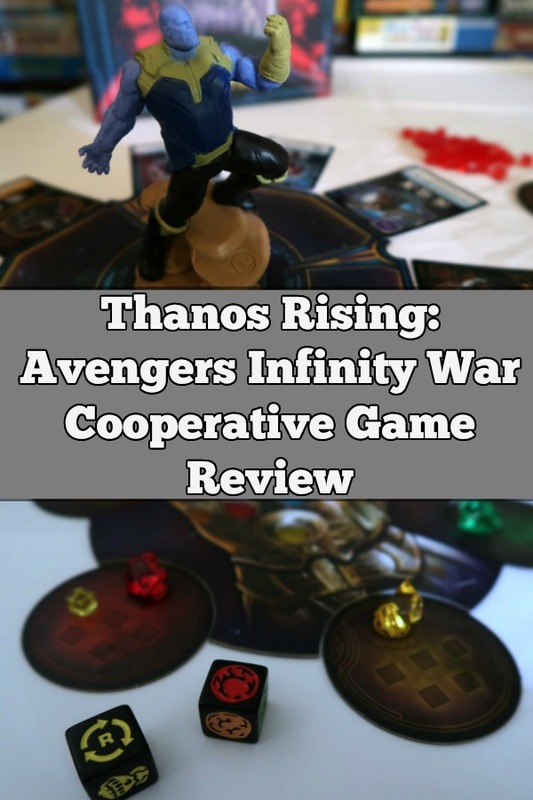 Thanos Rising: Avengers Infinity War is an excellent cooperative board game choice for game nights with friends. You can play this with adults and/or kids which makes it perfect for family game nights as well. Set up only takes a few minutes and overall it is easy to play, even with less experienced gamers. Pick up your own copy of Thanos Rising: Avengers Infinity War at your local board game store or on Amazon.